We believe that these absurd restrictions, if enacted, would allow for the handpicking of a jury intentionally & heavily weighted against the defendants. Everyone in Ireland has been involved in the water charges debacle; it is one of those issues where you are either for or against it. Going by the proposed restrictions only those who are for water charges will be allowed on the jury, deciding the case in advance in favour of the state & the privateers. This is the tactic of a dictatorship, a show-trial tactic. Every member of a trade union is signed up to the water charges campaign through ICTU. Besides this the vast majority of the Irish working class have campaigned or expressed themselves against the charges. Therefore these restrictions exclude almost the entire Irish working class – that is, all those who could justly be regarded as peers of the Jobstown 18 from serving on a jury which is to decide their guilt or innocence on charges of an extremely serious nature. We believe that the right to a jury of your peers is an essential aspect of the right to a fair trial. Also, it would be comical to suggest that the state is neutral on the issue of the monetisation of Irish water resources. The state has at all times been an active agent in the promotion of water charges. Should the state be true to principle of legal neutrality, it would have to withdraw the charges. Water charges campaigners being tried by the Irish State is the equivalent of mice being tried by cats – it is patently & a priori imbalanced & fundamentally unjust. Sadly, it is obvious to us as it to so many other observers in Ireland & Internationally that this whole affair is not in the least a matter of neutral justice, but of political revenge against a movement which has shaken corporate Ireland to the core. Attempting to stack the jury against the peaceful defenders of the principle of free water is of a piece with the uncalled for aggression of Gardai against working class communities throughout the water charges campaign, with the deliberate & co-ordinated villification of working class protesters by the corporate & state media, with the dawn raids against campaigning teenagers, with the fake outrage against water defenders expressed in often lurid terms by right wing politicians. All of these are tactics of those who would place a price on water intended to demonise, isolate, & ultimately destroy the movement of those who would not. In a deeply divided class society such as Ireland, where all mainstream means of expression are effectively under the control of a tiny & undemocratic minority acting solely in their own minority interests at all times, the only form of expression left to the majority is protest. It is therefore absolutely vital for any form of democracy to operate in ireland that the right to peaceful protest, including sit-down protest & including the temporary inconveniencing of politicians be defended. Put plainly, the aim of the repression of the water charges campaign is to shut the working class up so the ruling class can get on with with its business of privatising everything & making as much profit as can be made without regard to the social & cultural consequences for everybody else. We therefore call on all with a genuine interest in freedom of expression in Ireland to join with us in condemning the attempt by the DPP to pack the Jury against the Jobstown 18, whose courage, principle & dignity we honour & admire. 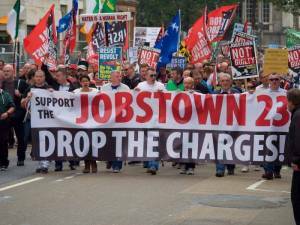 Updates from the Jobstown Trial - Media Bias continues! Joan Burton will begin her second day in the witness box today. She will continue to be questioned by barristers for the defence. Hopefully, this means that the media will actually cover the arguments of the defence barristers. Yesterday, Joan Burton gave her testimony for an hour and was crossed examined for 3 hours by the defence. Yet, all the media coverage focused on her testimony. There was very little coverage of the 3 hours of defence questioning. The Irish Times, supposedly the paper of record devoted a whole 6 lines from their coverage to the defence. Not to be outdone, Denis O Brien’s Indo didn’t report on the defence questioning, instead just making a passing reference to the fact that they questioned her. 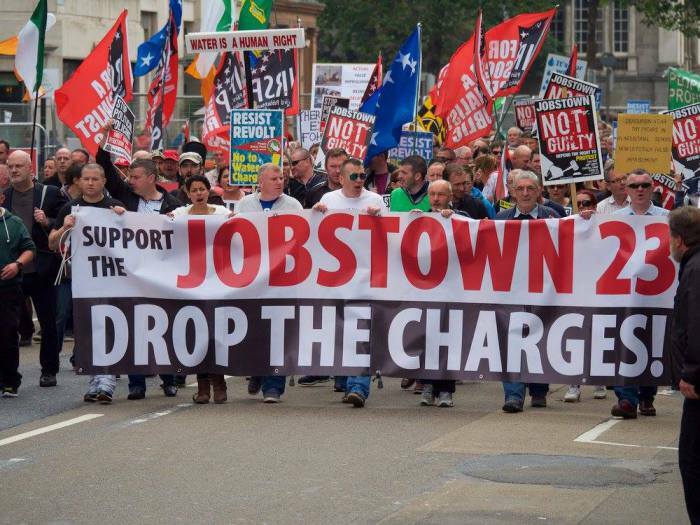 For 2 years in the lead up to this trial the media imposed a black-out of the #jobstownnotguilty campaign saying that they couldn’t report on it because it was ‘before the courts’. Any ordinary person would think that since it is now before the courts they would report it, but it seems that they are just intent on ignoring the campaign and will continue will continue with their one-sided coverage! There were audible gasps from the packed courtroom on day 5 of the #jobstownnotguilty trial during the cross-examination of Joan Burton. The defence put it to Button that her party had been ‘wiped out’ & ‘destroyed’ because they had betrayed people. She replied by defending their record and her own record personally, but accepted only that there a ‘perception’ that they had broken promises. The defence pointed out that this anger was reflected in the 2016 general results when the Labour Party dropped to 7 seats. Burton put this down to ‘populist politicians’ from the ultra left who wanted to ‘destroy’ the Labour Party & social democracy. There was a gasp in the courtroom as she then proceeded to tell the court “I’m one of the people who succeed James Connolly as leader of the Labour Party……and I carry on his ideas”. Then accused political opponents on the Left of wanting to destroy Connolly’s party. When asked if she accepted that large sections of Irish society were angry at the betrayals and broken promises of the labour party in government, she repeatedly claimed to have gotten an equal amount of positive responses and even boasted that she had gotten an “award” from the trade union movement! Apparently even the wipe out of the Labour Party in the general election wasn’t enough to impress this on her. But then this is a woman who can still claim with a straight face, and while under oath, that she made “no reductions in weekly social welfare rates”. Tell that to lone parents with children aged over 7, or young people whose dole was cut. A final incredible dimension of Burton’s testimony today was her comparisons of herself and her situation to famous Irish historical figures. Sitting in a Garda jeep, with dozens of gardai between her and an angry crowd of protesters and reading an Irish times article about Michael Collins, she pondered “how Michael Collins would have felt”. The absurdity of this comment sparked laughter in the court room – was she seriously comparing being delayed in a Garda jeep surrounded by gardai for a couple of hours to the ambush and assassination of Michael Collins in Beal na Blath? “I am one of the people who succeeded James Connolly.”, she preened, “It’s always been an honour to be in his party and carry on his ideas”. For Joan, so accustomed to spinning and twisting in the Dail, the fact she was in a witness box under oath was no deterrent. Going down the list of Irish writers who have expressed solidarity with the Jobstown martyrs, I recognise Christy Moore (a popular songwriter & singer) and David Lordan, the poet. Unfortunately, I've never read anything by the other names on the list. I suppose some of them have written cheques. Socialist party have written an interesting analysis of how Labour tried to use this issue. Also this earlier one helps connects the dots of the agenda too. Charges for one of the seven accused dropped. The Herald reports today that all charges to one of the seven Jobstown accused Ken Purcell have been dropped. More coverage of the trial on RTE today.Case is adjourned until Monday when the 11 member jury will hear the judge's charge before beginning to deliberate on a verdict. 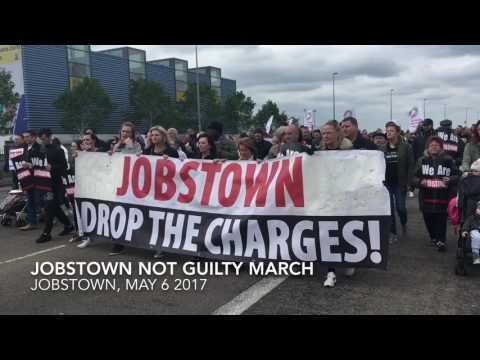 As reported on RTE news today all six have been found not guilty in the Jobstown Trial as returned by the 11 member jury with unanimous verdicts. The seventh person was let go a few weeks back when their case was dismissed. This was clearly a political trial but a good day for the people as the government clearly hoped it could be used to silence any further dissent in the future.